As we begin the new year, many of you have likely “resolved” to make some sort of change—entering into 2019 with a “new year, new me” attitude. Amongst your list of resolutions may appear drinking more water, saving more money, organizing your home, getting more exercise, clocking more hours of sleep each night, or eating healthier. All listed are great goals, however, you likely know how big changes are made—through building upon small changes. New Year’s Resolutions often go awry as a result of a “derailed” plan and feeling as though it’s too late to turn back—you’ve already failed at accomplishing your goal. Should a poor decision or an “off day” occur, a mentality of starting each day with a clean slate can help you reach your goals successfully. If you recognize, but do not dwell upon, previous failures and acknowledge previous successes but continue to strive for more, you’ll enable yourself to live in the moment and work to be better each day. That said, whether we have hit rock bottom and feel like we are “done” dealing with diabetes or if we feel like we are at the top of our game after receiving the “best” A1c of all time, Camp Kudzu yearns to spread the message of our theme of 2019 loud and clear—we can be better. All of us. If we do not continue to strive to be better, we remain the same and over time, become complacent. That said, Camp Kudzu has grown exponentially in its 20 years of existence. From one overnight session that hosted 96 campers to four overnight sessions plus a multitude of other programs that collectively serve over 850 children and teens living with T1D, Kudzu continues to strive for more. 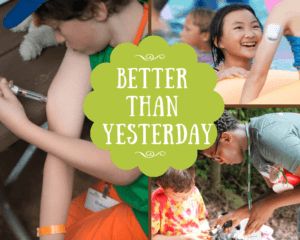 With “Better Than Yesterday” as our motto for the year, Camp Kudzu realizes that each camper impacted by our programs has also impacted us in some way—making us better than yesterday.